Now in its twenty-fifth anniversary edition, "Maroon Societies" is a systematic study of the communities formed by escaped slaves in the Caribbean, Latin America, and the United States. These societies ranged from small bands that survived less than a year to powerful states encompassing thousands of members and surviving for generations and even centuries. The volume includes eyewitness accounts written by escaped slaves and their pursuers, as well as modern historical and anthropological studies of the maroon experience. 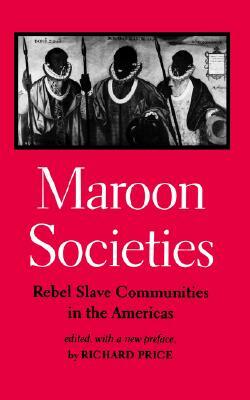 "From the recipient of the J. I. Staley Prize in Anthropology"
Description: Now in its twenty-fifth anniversary edition, Maroon Societies is a systematic study of the communities formed by escaped slaves in the Caribbean, Latin America, and the United States. These societies ranged from small bands that survived less than a year to powerful states encompassing thousands of members and surviving for generations and even centuries. The volume includes eyewitness accounts written by escaped slaves and their pursuers, as well as modern historical and anthropological studies of the maroon experience. Richard Price divides his time between rural Martinique and the College of William and Mary, where he is Dittman Professor of American Studies and Professor of Anthropology and History. His many books include First-Time, winner of the Elsie Clews Parsons Prize of the American Folklore Society, Stedman's Surinam (with Sally Price), and Alabi's World, recipient of the American Historical Association's Albert J. Beveridge Award and the Gordon K. Lewis Memorial Award for Caribbean Scholarshipall three available as Johns Hopkins paperbacks.